This year the 51st Commission on Population and Development takes place from April 9th to the 13th at the United Nations Headquarters. 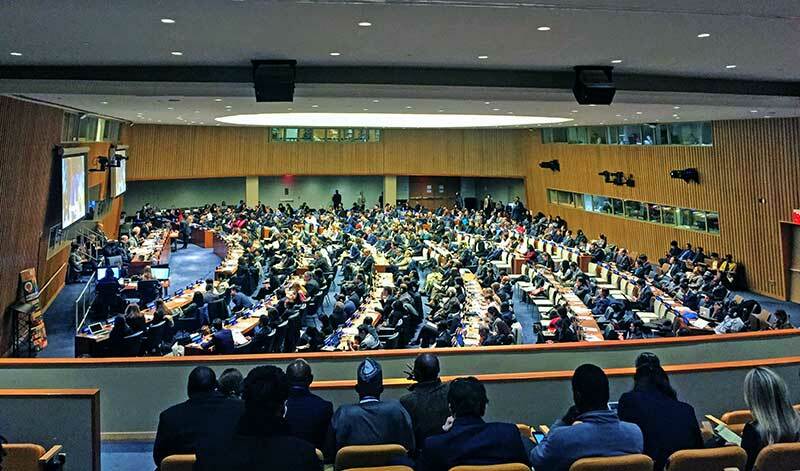 The Commission functions as a way to advise the UN’s Economic and Social Council (ECOSOC) on matters related to population issues and trends, integrating population and development strategies, development policies and programs related to population, and provisions of population assistance. The theme of this year’s Commission is “Sustainable cities, human mobility and international migration”. With migration being a large focal area at the UN (we are currently in the third round of intergovernmental negotiations for the Global Compact on Migration) a majority of the dialogues for the Commission will dissect issues in depth pertaining migration and how everyday aspects of living are impacted due to this. On the first day of the Commission, Monday April 9th, I attended the keynote statement presented by Dr. Gora Mboup entitled Urbanization and Migration- Two Global Mega Trends: Diversity, Opportunities and Challenges. In his presentation, Dr. Mboup spoke about three key points when it comes to assessing migration at the local and international level. Migration is inevitable; therefore we must make sure that urban cities are equipped with the proper resources and policies in place needed in order to facilitate the integration of new migrants into society. This means having social protection floors that guarantee access to health, education, workers rights, land rights, and other basic necessities. Data proves that migration strengthens economies. Despite this evidence there is still widespread racism and xenophobia that plague countries surrounding immigrants. Governments should find it in their best interest to help foster intercultural communication at the local and national level. National policies need to reflect the realities of urban cities. Take the United States for example. As of November 2017, there are currently 300 state and local governments that have sanctuary policies. States have claimed to be safe havens despite the anti-immigrant attitude and agenda of our current Administration. In order to make migration mutually beneficial and improve the lives of everyone, central governments, local authorities, academia, civil society, and other humanitarian agencies, need to work collaboratively. Migrants need also be stakeholders in their own future. Not including them in the decision making process hinders the potential to create inclusive social and economic policies. The Commission is an essential part of ECOSOC because it creates opportunities to reflect and have open dialogues around important issues that we face as an international community. The Commission is composed of 47 Member States, all of whom have the potential to be challenged on these issues, to engage with other member states and agencies, and to introspect on the shortcomings in relation to social development. At the interactive dialogue with Dr. Gora Mboup, only 4 Member States engaged in the conversation with the speaker: Mexico, Zambia, Cuba, and the Philippines. Four out of forty-seven is not a good turnout, but it is a step in the right direction. Participation is a stepping-stone to collaboration, and that is something I look forward to during this Commission.